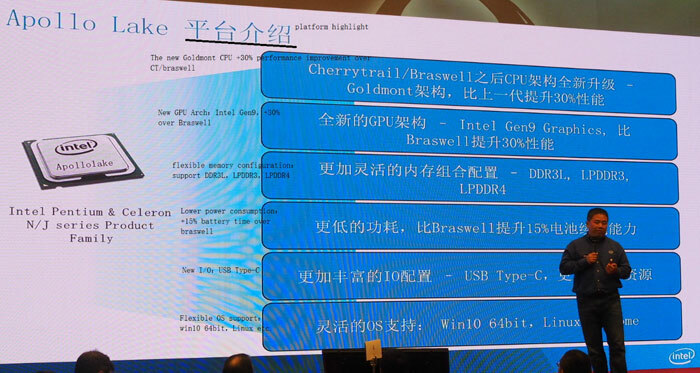 Intel showed off a few slides and discussed the performance of the upcoming Apollo Lake SoCs last week at Computex. AnandTech forum member Paul Jackson was at the presentation and took some illuminating snaps (via Liliputing) of the slides, reproduced here today. Overall it seems that Apollo Lake will provide a decent (30 per cent) uplift in performance compared to previous generation Cherrytrail/Braswell parts. In addition to the above, the new SoC brings with it new I/O options such as USB Type-C, contributes to a cheaper BOM for manufacturers, and provides flexible OS support like previous gen SoCs. Remember these figures from Intel will be showing the new processors in the best light possible, so the touted percentage point advantages might not be as significant in the real world. The first new low-power, low-cost Apollo Lake chips are expected to start appearing in devices in H2 this year. Just like predecessors these will be branded as Intel Celeron and Pentium N chips and are likely to feature mainly in lower cost laptops, Chromebooks, and 2-in-1s. the current intel celeron 3050 and Pentium N3700 have an amazing core performance sometimes comparable to mobile intel i3 ivy bridge in certain tasks but the graphics need to improve I hope the Apollo lake will offer better GPU's. Bra-swell. Really? Was someone was taking the mick with that one?! How on earth did that get through branding? That doesn't say 30% IPC, so I'm guessing they just turned the clocks up 30%. That might be enough to keep up with the ~3GHz ARM chips that are on the horizon.